Because it won't actually be a Tesla rival. It will be something much different. Last month, with a sub-20,000 euro ($22,836) price tag. that this future EV in VW's electric ID model range would reportedly cost less than 18,000 euros ($21,000) and act as a sub-compact rival to a Tesla. This type of bold claim had to come with some skepticism, especially given VW's earlier announcement claiming future (around $25,000). 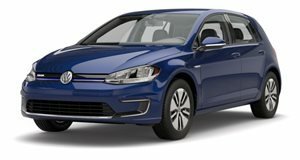 Inside EVs was quite skeptical as well, so the , Vice President of Volkswagen North American Region, at the 2018 Los Angeles Auto Show about this rumored affordable EV. Renna also happens to be a former Tesla Product Manager, so he is very familiar with the rest of the EV market. According to Renna, this affordable EV model from VW isn't actually some surprising new Tesla-fighter. It is actually a , which has never been sold in the United States as an EV or as a gas-engine model. Like the current e-Up, this new model won't make it to US shores and will continue to be sold only in Europe. The next-generation model will have an increased range compared to the current car's lackluster 93-mile figure but it certainly won't be considered as a Tesla-rival. Since the e-Up is outside of Renna's market, he couldn't comment on when it will arrive. Other sources claim it should go on sale sometime in 2020. Unlike the rest of the ID range, which will mostly be offered in the US, the next-generation e-Up will not ride on VW's MEB platform. So if the recent speculation regarding VW's upcoming Tesla-rivaling car for $21,000 had you excited, we are sorry to burst your bubble - this EV won't be coming to the US, not that many would buy one even if it did.